Durable dog leash in our best selling Original Designs feature a convenient gate style snap. Simply push the snap onto the collar's D-ring and you're ready to go! Ultra-soft padded handle for comfort while walking even the strongest of pullers Simple, secure snap for easy D-ring attachment. 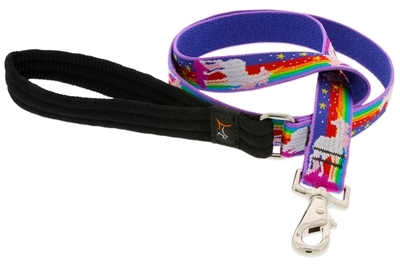 Built-in swivel resists twisting Welded steel hardware Strong, durable woven nylon webbing Complete the set with a matching dog collar and Dog Tag Art ID tag. Something! This handle makes â€œsquirrelâ€ moments so much easier! Yay! Love the product and excellent customer service!! Great 6' leash for daily walks. New Unicorn pattern is really nice when combined with the collar and harness.